I continue my love affair with paintings that are best described as "Sunday Afternoon Art". These pieces were created usually by ladies in the late 1800s as good leisure occupation for Sunday afternoons. 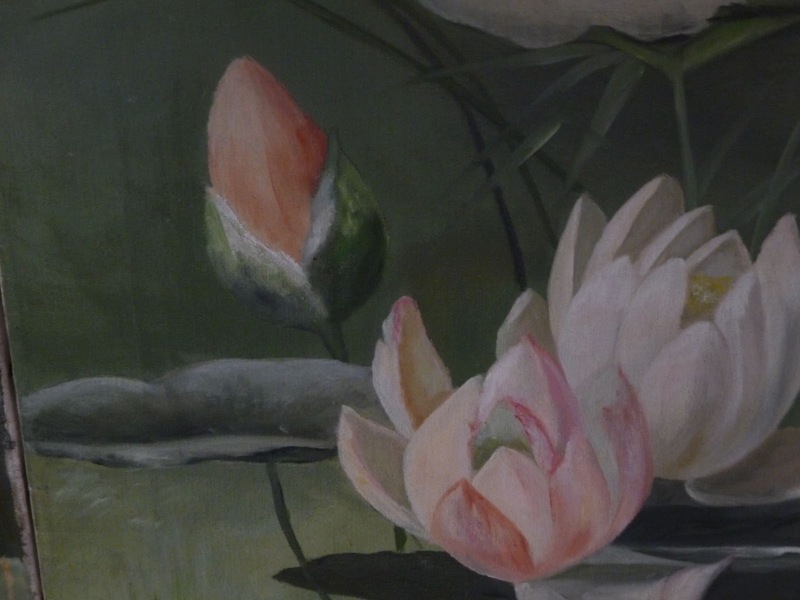 Women in the middles and upper classes who did not have chores to do on Sundays were taken with the natural world and particularly horticulture--and would paint flora and fauna simply for their own enjoyment. 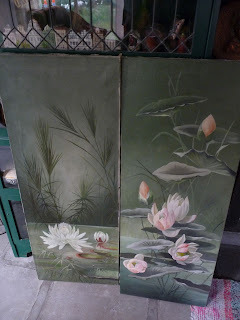 Sometimes these paintings were signed--but most times they were not. Yes they are sentimental. Yes they are "old fashioned". Yes they are fabulous. These beauties are a complimentary pair, unframed and in terrific original condition. These were usually framed in heavily ornate frames--that I think actually can detract from the very talented depiction of nature. They can stand well on their own. 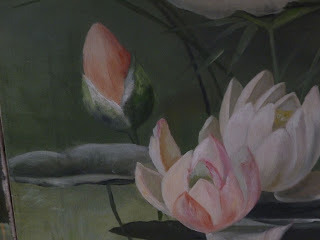 I am accumulating many of them for the Blumen Gardens Show in Sycamore Illinois on April 27-28. I love all things vintage french. There is something about the french and design--and you can just tell when something is made in France or has french design influence. If it is handpainted and toleware--all the better. 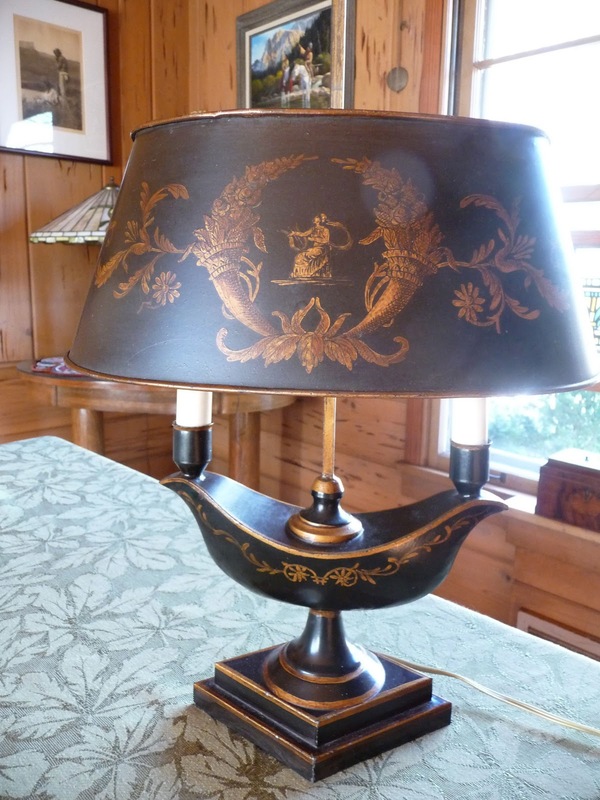 At a recent auction--buried on tables of dreck--was a diamond in the rough--this fabulous vintage french bouillotte lamp with a metal tole shade. I saw it--or maybe Dear Husbola saw it first--and my heart started beating faster. This great handpainted french lamp is marked on the bottom. It was made in France in the 1940s-ish--and all the gold is handpainted. These signature items were marketed in high end stores--particularly Neiman Marcus and Marshal Fields. For as long as I have been selling on ebay--the mid 1990s--these have been in demand. 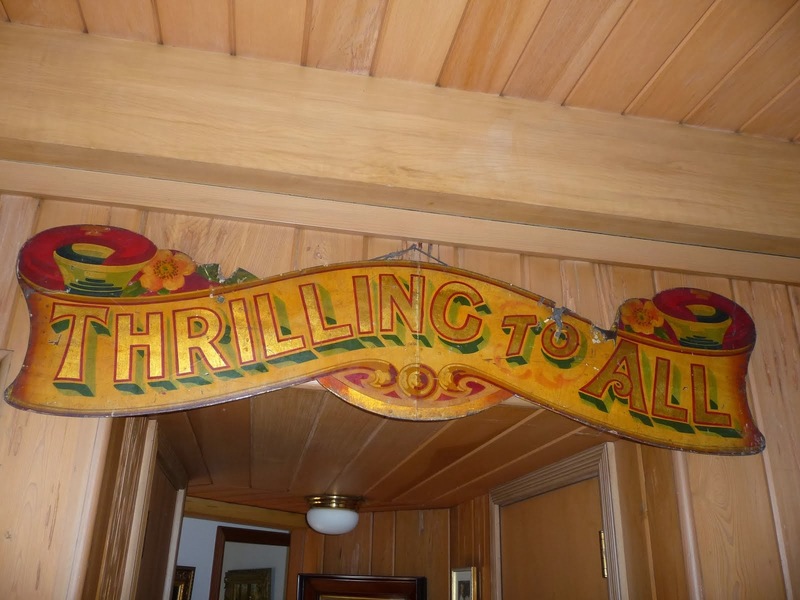 So in demand--that at the recent Northern Illinois Antique Dealers Show in Rockford--we sold another one--different style--in the first hour. Love these lamps. 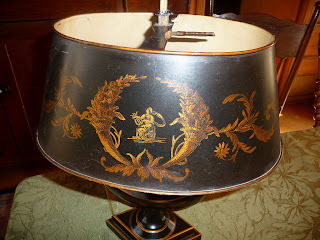 You can see this lamp on an ebay.com auction under our selling name sellinglikecrazy. Spring is in the air--daffodils are popping up, daylight savings time starts Saturday night, midwestern weather promises to be in the 70s next week--and diamonds show up in the dreck at auctions. I love spring! Dear Husbola and I just returned from a twice yearly trek to downstate Illinois to attend a weekend full of shows and visit a passel of shops. (Where we just came from--they say "passel" instead of "many") We thoroughly enjoy traveling three hours south of us--because it feels like a million from home. All in a nice way. Last night--after going to two antique shows, and an Amish grocery store--we decided on dinner at an Italian restaurant we have eaten in before. Last November, Dear Husbola chowed down on eggplant parmesan and I remember a glass of good white wine the size of a small cistern. Oh boy--what a difference a few months makes. We should have taken it as a clue that last year the parking lot was jammed when we arrived. This year--two other cars. On a Friday night. In a town where fine dining is most often Denny's. Hungry and hopeful--we went in anyway. Two of three dining rooms did not even have lights on. But we were greeted warmly and given a seat. Actually our pick of several dozen tables. The server was pleasant but when I asked to order some wine--we were told that the bar had moved out at the first of the year and with it the liquor license. OH NO--Italian food without a little wine? The framed articles about their interesting chef were missing from the walls. Well--the hot breadsticks were good dipped in olive oil, the lettuce salad limp but serviceable --and the lasagna had good flavor, but I am not remembering any noodles. But, Tony Bennett was singing hits from the 50s throughout the dining room, we had a car full of antique treasures for resale, I was with my charming Dear Husbola who 95% of the time puts a positive spin on things, and we were planning our attack at the biggest antique show for the next morning.